All of the individuals listed in the Breeders List are DVSCWTC members in good standing and have agreed to abide by the SCWTCA Code of Ethics. Breeders may choose to list a recent litter or that puppies are expected soon; however, not all breeders choose to do so. If you are looking for a puppy, you may want to contact all breeders in your area. 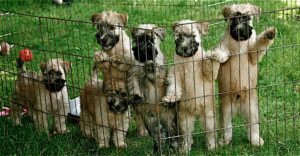 The Delaware Valley Soft Coated Wheaten Terrier Club (DVSCWTC) does not endorse, recommend or warrant any breeders or dogs included on the Breeders List or a litter listing included therein, and DVSCWTC assumes no liability for the listings of breeders or litters. Participants in the Breeders List including but not limited to those who list a litter on the DVSCWTC website agree to hold DVSCWTC harmless from any and all liability associated with the Breeders List and to indemnify DVSCWTC for any costs incurred defending legal and any other actions resulting from the listings or their placement actions. Accordingly, there is no written or implied recommendation of these breeders by DVSCWTC nor is there any guarantee of the services of said member.